How do we teach our players to think for themselves? Last summer I was at a coaching conference in Kamloops when I had the opportunity to watch a presentation from Serge Lajoie, the head coach of the University of Alberta Golden Bears. Serge basically taught every coach in the room what forecheck he was planning on using in the season to come, which is even more interesting if you consider the fact I was sitting in the front row, a couple months prior to stepping on the bench for the UBC Thunderbirds. No, for Serge, the crucial component of his forecheck, an element that couldn’t be exploited by a rookie CIS coach, was the ability for his players to read the play. 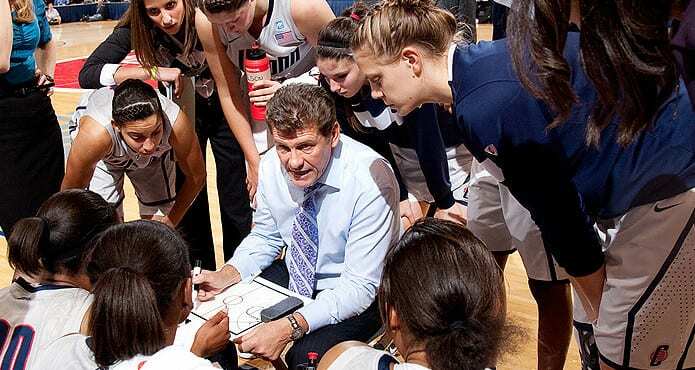 Geno Auriemma, head coach of the University of Connecticut’s Women’s Basketball program, also believes strongly in teaching his players to make their own reads and ultimately make their own decisions on the court. For Coach Auriemma, teaching the game of basketball starts with the culture of your team. It’s not necessarily the culture you instil, either – it has to be the culture and character they bring to the table. I’ve written before about Coach Auriemma’s belief in body language and habits, but the bottom line is that once you’re with his team and on the court, it’s that culture that allows players to play the right way. For Coach Auriemma, if you hold your players accountable, they’re skilled, and they want to get better, then that’s when you find the sweet spot of players who know how to solve their own problems. “I coached high school, so I coached bad players,” Auriemma says in the video below. As a coach, you have to find any way you can to make players better. And if that means you have to drive them into the ground or push them to reach a level they never knew possible, well then you’re doing your job. Sure, every coach has systems and strategies, but as head coach of the Carolina Hurricanes Bill Peters told us earlier this week, your strategies mean nothing if your players aren’t engaged and ready to execute. What’s one of the best signs of a player who’s able to execute? A player who’s able to read the play. Check out coach Geno below and judge for yourself!